Not to be confused with Speed the Plough. Speed-the-Plow is a 1988 play by David Mamet that is a satirical dissection of the American movie business. As stated in The Producer's Perspective, "this is a theme Mamet would revisit in his later films Wag the Dog (1997) and State and Main (2000)". As quoted in The Producer's Perspective, Jack Kroll of Newsweek described Speed-the-Plow as "another tone poem by our nation's foremost master of the language of moral epilepsy." The play sets its context with an epigram (not to be recited in performance) by William Makepeace Thackeray, from his novel Pendennis, contained in a frontispiece: It starts: "Which is the most reasonable, and does his duty best: he who stands aloof from the struggle of life, calmly contemplating it, or he who descends to the ground, and takes his part in the contest?" The character of Bobby Gould finds himself on both sides of this dilemma, and at times in the play he "stands aloof", and at other times he "takes part" in life's contest, with its moral strictures. Fox is beside himself about the big break he has gotten, which could finally make him a player in Hollywood after years of toiling in obscurity. It could also make him rich. He requests coffee and Gould asks his secretary to get some. As they wait, Gould tells Fox about a book he has been asked to give a "courtesy read" to, meaning that it is not seriously being considered to be made into a film because the author is "an Eastern sissy writer". Gould's secretary, Karen, arrives with the coffee and the two men ebulliently chat with her about the movie business and their experiences related to it. Karen is only temporarily filling in for Gould's regular secretary and is new to the ways of Hollywood. Gould asks her to make lunch reservations for them and she leaves. Karen returns to discuss the lunch reservation. Gould asks her to sit and begins to tell her about the movie business. He tells her about the book he has been giving a "courtesy read". Uncorrupted and naïve, she asks why he is so sure there is no hope for the book. Gould offers Karen a chance to take part in the process by reading the book and delivering to him her opinion of it to him that night at his home. As she leaves, Gould asks her to tell Fox that "he owes me five hundred bucks". The next morning Fox is back in Gould's office, excited about their upcoming meeting with the studio head. Gould surprises Fox with news that instead he is going to be pitching the Radiation book, without him. The passive Fox initially takes the news with good humor, but gradually becomes more and more aggressive. He chides Gould for preparing to throw both of their careers away by pushing a movie the studio will never agree to make. Gould says that he has been awake all night and feels the call to "do something which is right". Fox suspects that Gould spent the night with Karen and that is the reason for his delirium. Gould denies this, but an increasingly enraged Fox physically attacks him and continues his verbal assault until Gould tells him to go. There is an 18th-century English play by Thomas Morton called Speed the Plough, which gave the world the character of that arch-prude Mrs. Grundy. In George Meredith's novel The Ordeal of Richard Feverel, the young protagonist, running away from home, encounters two peasants discussing their experiences, the Tinker and Speed-the-Plow. Describing them to a relative, he says, "Next, there's a tinker and a ploughman, who think that God is always fighting with the Devil which shall command the kingdoms of the earth. The tinker's for God, and the ploughman—"
I remembered the saying that you see on a lot of old plates and mugs: "Industry produces wealth, God speed the plow." This, I knew, was a play about work and about the end of the world, so "Speed-the-Plow" was perfect because not only did it mean work, it meant having to plow under and start over again. 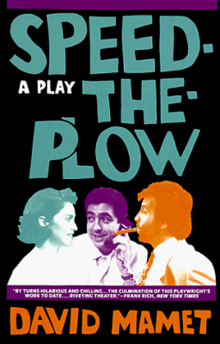 Speed-the-Plow premiered on Broadway at the Royale Theatre in a production by the Lincoln Center Theater, opening on May 3, 1988 and closing on December 31, 1988 after 279 performances. The cast featured Joe Mantegna (Gould), Ron Silver (Fox) and Madonna (Karen). The play was nominated for a Tony Award for Best Play and Best Direction of a Play (Gregory Mosher). Silver won a Tony Award for Best Actor (Play). The first Broadway revival of Speed-the-Plow, directed by Atlantic Theatre Company artistic director Neil Pepe, began previews at the Ethel Barrymore Theatre on October 3, 2008, with an opening on October 23 in a limited engagement, closing on February 22, 2009. The cast featured Jeremy Piven as Bobby Gould, Raúl Esparza as Charlie Fox, and Elisabeth Moss as Karen. However, Piven left the production over medical issues on December 17. The role of Bobby was played by Norbert Leo Butz (from December 23 through January 11, 2009) and William H. Macy (from January 13 through February 22, 2009). Raul Esparza was nominated for the 2009 Tony Award for Best Performance by a Leading Actor in a Play. Reviews were positive. It has been produced countless times in regional theaters and schools across the country. The play was presented at the Remains Theater in 1987 starring William Peterson, the Geffen Playhouse, Los Angeles, in February and March 2007. Directed by Geffen artistic director Randall Arney, the cast starred Alicia Silverstone as Karen, Greg Germann as Charlie Fox and Jon Tenney as Bobby Gould. In 1989, it was produced at the National Theatre, directed by Gregory Mosher, with Colin Stinton, Alfred Molina and Rebecca Pidgeon. In 2000, the play was produced at the New Ambassadors Theatre with Mark Strong, Kimberly Williams and playwright Patrick Marber in his stage debut, and then transferred to the Duke of York's Theatre with a new cast of Nathaniel Parker (Bobby Gould), Neil Morrissey (Fox) and Gina Bellman (Karen) and a new director, Rupert Goold. In 2008, it was revived at the Old Vic Theatre, starring artistic director Kevin Spacey as Fox, Jeff Goldblum as Gould, and Laura Michelle Kelly as Karen. In September 2014, it was performed in the West End at the Playhouse Theatre, and was directed by Lindsay Posner, with Nigel Lindsay as Fox, Richard Schiff as Gould, and Lindsay Lohan as Karen. In 2016, a production was produced by the Sydney Theatre Company at the Roslyn Packer Theatre. It was directed by Andrew Upton and featured Damon Herriman as Bobby, Lachy Hulme as Charlie and Rose Byrne as Karen. It ran from November 8 to December 17, 2016. In 2017, the production is produced by Dionysus Contemporary Theatre at the Hong Kong Academy for Performing Arts Lyric Theatre. It is directed by Olivia Yan, with the cast of Anthony Wong (Bobby Gould), Jan Lamb (Fox) and Rosa Maria Velasco (Karen), produced by Joyce Cheung. It will be the first time ever that the play has been translated into Chinese and performed in Cantonese. Bobby Gould's story is continued in Mamet's one act play Bobby Gould in Hell. According to Mel Gussow, Arthur Kopit's play Bone-the-Fish (later rewritten as Road to Nirvana) "could be regarded as Mr. Kopit's response to David Mamet's Speed-the-Plow. In fact, the plays share much more than two hyphens. Mr. Kopit asks how far a film director will go in demeaning himself in quest of work." ^ a b Davenport, Kent. "Speed-the-Plow". The Producer's Perspective. Retrieved January 28, 2019. ^ Thackeray, William Makepeace (1910) [1848–1850]. "Frontispiece". Pendennis. Volume 2. Everyman's Library No. 426. London; New York: J. M. Dent & Sons; E. P. Dutton & Co. Retrieved January 28, 2019. ^ Christiansen, Richard (February 19, 1989). "The 'Plow' Boy". Chicago Tribune. Arts Page 18 Section 13. Retrieved January 28, 2019. ^ "The Tony Award Nominees - TonyAwards.com - The American Theatre Wing's Tony Awards® - Official Website by IBM". TonyAwards.com. June 7, 2015. Retrieved March 2, 2016. ^ Als, Hilton (November 3, 2008). "The Theatre: Fever Pitch". The New Yorker. 84 (35): 116–118. Retrieved April 17, 2009. ^ "Speed the Plow: the dark hollywood dilemma". PLANK Magazine. Retrieved March 2, 2016. ^ Billington, Michael (February 13, 2008). "Speed-The-Plow". The Guardian. London. Retrieved January 28, 2019. Wikimedia Commons has media related to Speed-the-Plow. This page was last edited on 23 February 2019, at 06:56 (UTC).